Here's some poop we won't mind scooping: Scientists at Michigan State University have discovered a strain of bacteria that literally excretes gold. Cupriavidus metalliduran, according to microbiologist Kazem Kashefi and electronic artist Adam Brown, doesn't just survive on toxic concentrations of auric chloride, it thrives. By feeding a colony unprecedented quantities of the naturally occurring but deadly compound—a process they believe mirrors what happens in nature—the duo managed to coax the microbes into metabolizing the toxins into 24-karat gold. The irony? The process would be cost-prohibitive on a large scale. So Kashefi and Brown did the next best thing: they turned their research into an art installation. Kashefi and Brown have achieved the seemingly impossible: producing one of the world’s most valuable substances out of dross. Their installation, The Great Work of the Metal Lover, references the “magnum opus” or “great work” of creating the Philosopher’s Stone, a legendary substance, said to transmute base matter into gold, that has eluded alchemists for centuries. Kashefi and Brown have achieved the impossible: producing one of the world’s most valuable substances out of dross. Their setup uses a living system as a “vehicle for artistic exploration,” says Brown. The artwork consists of a portable laboratory made of out of 24-karat gold-plated hardware, a glass bioreactor, and the bacteria, which, together, produce gold over the course of a week in front of an audience. Accompanying the equipment is a series of images made with a scanning electron microscope. Using ancient gold-illumination techniques, Brown applied 24-karat gold leaf to regions of the prints where a bacterial gold deposit had been identified, so that each print contains some of the bioreactor-produced gold. But the project also raises questions about greed, the economy, and environmental impact, as well as the ethics of tinkering with nature, he adds. “Art has the ability to probe and question the impact of science in the world, and The Great Work of the Metal Lover speaks directly to the scientific preoccupation while trying to shape and bend biology to our will within the post-biological age,” he says. The Great Work of the Metal Lover received an honorable mention at the world-renowned cyber-art competition, Prix Ars Electronica, in Austria, where it’s on display until October 7. The Great Work of the Metal Lover by Adam Brown. A bioreactor uses a gold-loving bacteria to turn liquid gold into usable, 24-karat gold. Gold being produced in a bioreactor. 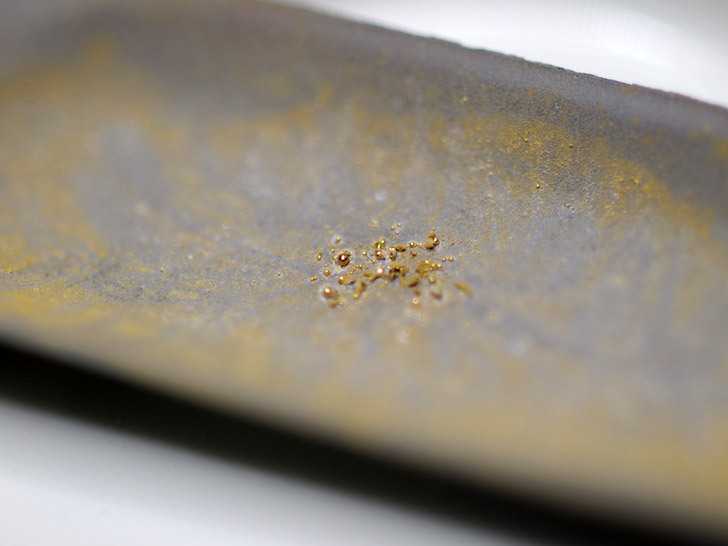 Gold deposits produced in the bioreactor. A nugget of 24-karat gold. Adam Brown, associate professor of electronic art and intermedia at Michigan State University.